205 Commonwealth is located on the north side of Commonwealth, between Exeter and Fairfield, with 203 Commonwealth to the east and 207 Commonwealth to the west. 205 Commonwealth was designed by Peabody and Stearns, architects, and built ca. 1883 for Samuel Endicott Peabody and his wife, Marianne Cabot (Lee) Peabody. They also maintained a home, Kernwood, in Salem, which previously had been their primary residence. S. Endicott Peabody purchased the land for 205 Commonwealth from the Commonwealth of Massachusetts on March 20, 1883. It appears that construction might have begun even before he took formal title to the land, inasmuch as he entered into a party wall agreement dated March 17, 1883, three days prior to his deed from the Commonwealth, in which reference is made to the party wall “now existing” between the two houses. 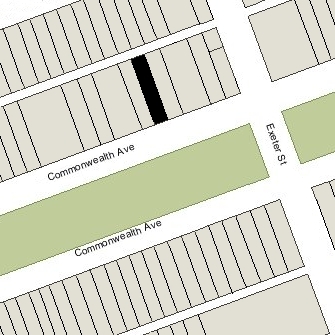 He entered into a party wall with the owners of 203 Commonwealth on November 21, 1883, and was listed in the Boston Blue Book for 1883 as residing at 205 Commonwealth for the 1882-1883 winter season. Click here for an index to the deeds for 205 Commonwealth. Samuel Peabody was a former merchant in the China and India trade. During the 1870s, he and his family lived in England, where he was a partner in the US banking firm of J. S. Morgan & Co. They returned in the late 1870s and in 1881 he became President of the American Loan & Trust Company in Boston. The Peabodys continued to live at 205 Commonwealth until about 1894, after which they made Salem their year-round residence. On June 28, 1894, 205 Commonwealth was acquired from S. Endicott Peabody by Alice Ormond (Spaulding) King, the wife of Henry Parsons King. They had lived at 176 Commonwealth during the previous season. They also maintained a home in Prides Crossing. Henry King was a boiler and elevator manufacturer. The Kings continued to live at 205 Commonwealth during the 1906-1907 winter season, but moved soon thereafter and by the 1908-1909 season were living in a new home they had built at 118 Beacon. 205 Commonwealth was not listed in the 1908 and 1909 Blue Books. On July 1, 1908, 205 Commonwealth was purchased from the Kings by Philip Shelton Sears. He and his wife, Mary Cabot (Higginson) Sears, made it their home. They previously had lived at 315 Commonwealth. Philip Sears was a lawyer and trustee. After World War I, he retired from the law and became a noted sculptor. 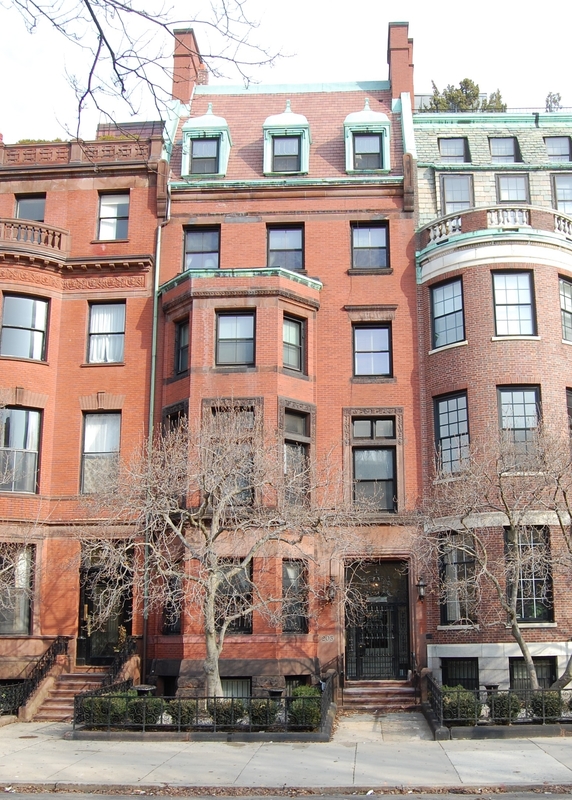 The Searses continued to live there until 1917, when they moved to Brookline. On April 25, 1917, James McNaughton purchased 205 Commonwealth from Philip Sears. He and his wife, Mary E. (Morrison) McNaughton, made it their home. They previously had lived in Brookline. James McNaughton was general manager of the Calumet and Hecla mines in Calumet, Michigan. They continued to live at 205 Commonwealth during the 1921-1922 winter season, but moved soon thereafter back to Brookline. In 1922, 205 Commonwealth was briefly the home of paper manufacturer Herbert Warren Mason and his wife, Persis Emery (Furbish) Mason. They had lived at 14 Gloucester in 1921. They also maintained a home in Ipswich. By 1923, they had moved to 24 Chestnut. On October 24, 1922, 205 Commonwealth was purchased from James MacNaughton by Robert Gould Shaw, II. He and his wife, Mary (Hannington) Shaw, made it their home. Robert Shaw was a gentleman farmer and noted polo player. His father, Quincy Adams Shaw, was the developer of the Calumet and Hecla mines. On April 14, 1926, 204 Commonwealth was acquired from Robert Gould Shaw, II, by Margarett Hunnewell (Sargent) McKean, the wife of Quincy Adams Shaw McKean. They had lived at 21 Commonwealth during the 1925-1926 winter season. Quincy Adams Shaw McKean was Robert Gould Shaw, II’s, nephew (the son of Shaw’s sister, Marian). The McKeans also maintained a home in Prides Crossing. Quincy Adams Shaw McKean was a banker and broker. Margarett Sargent McKean was a noted painter and sculptor. Robert and Mary Shaw appear to have continued to spend their winter seasons at 205 Commonwealth through the 1928-1929 winter season. They, and not the McKeans, were listed there in the 1927-1929 Blue Books. During the 1930-1931 winter season, the McKeans spent their winter season at their home in Prides Crossing. They subsequently leased 205 Commonwealth to others. 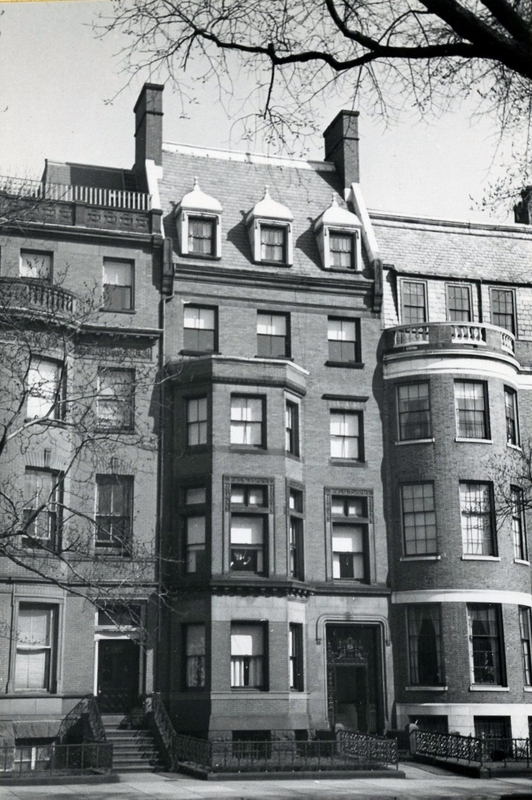 By 1931, it was the home of retired Rear Admiral Cameron McRae Winslow and his wife, Theodora (Havemeyer) Winslow. They previously had lived in Rhode Island. He had served as Commander in Chief of the US Pacific Fleet in 1915 and 1916. The Winslows’ adult children lived with them: Natalie Winslow, Cameron McRae Winslow, Jr. (a naval officer), Theodora Winslow, Emily Winslow, John Chilton Winslow, and Arthur Winslow. They also maintained a home in Newport. Admiral Winslow died in January of 1932. Theodora Winslow and their children moved to 166 Marlborough. During the 1932-1933 winter season, 205 Commonwealth was the home of Bayard Tuckerman, Jr., and his wife, Phyllis (Bayard) Sears. They also maintained a home in South Hamilton. Bayard Tuckerman was an insurance broker and racing enthusiast, one of the founders and the first president of the Suffolk Downs race track. During the 1931-1932 season, they had maintained their Boston residence at 97 Mt. Vernon, and by the 1933-1934 season they were living at the Hotel Sheraton at 91 Bay State Road. By the 1944-1934 winter season, 205 Commonwealth was the home of attorney Bartlett Harwood and his wife, Mary Louise (Ramsdell) Spaulding Harwood. They previously had lived at 170 Beacon. Mary Louise Spaulding, Mary Harwood’s daughter by her first marriage, to Henry Blanchard Spaulding of Buffalo, lived with them. They continued to live at 205 Commonwealth in 1937, but had moved to 49 Beacon by 1938. By 1938, 205 Commonwealth had once again become the home of Quincy Adams Shaw McKean and Margarett McKean. By 1939, they had moved to Beverly. The house was shown as vacant in the 1939-1941 Boston City Directories. On July 9, 1941, 205 Commonwealth was purchased from the McKeans by Marie C. Sullivan. She previously had lived in an apartment at 291 Commonwealth. In November of 1941, she applied for (and subsequently received) permission to remodel 205 Commonwealth and convert it from a single-family dwelling into a lodging house. The Society continued to be located at 205 Commonwealth in the fall of 1944. On September 11, 1946, 205 Commonwealth was purchased from Marie Sullivan by The Duncanbury School of Arts. Duncanbury School had been founded in 1945 by Miss Evelyn M. Duncanson and Miss Helen M. Canterbury. Miss Canterbury (who also was a piano teacher) was president and Miss Duncanson was secretary-treasurer; they lived at 238 Hemenway. In March of 1947, the school applied for (and subsequently received) permission to convert 205 Commonwealth from a lodging house into a school. On October 21, 1949, 205 Commonwealth was purchased from The Duncanbury School of Arts by Massachusetts Memorial Hospitals, Inc., operators of the Boston University’s hospitals and medical services. It had purchased 203 Commonwealth in June of 1949. By the time of the sale, it appears that Evelyn Duncanson and Helen Canterbury no longer were affiliated with the school: Alfred H. Avery was the president and Alden I. Avery was the treasurer. On October 2, 1949, the Boston Globe noted that “Helen M. Canterbury and Evelyn M. Duncanson, founders of the Duncanbury School of Arts, Inc., announce the opening of a new studio of dance at 334 Newbury.” In April of 1950, they purchased 116 Commonwealth. In October of 1949, Duncanbury School of Art and Massachusetts Memorial Hospitals jointly filed for (and subsequently received) permission to combine 205 Commonwealth and 203 Commonwealth, and to convert the combined building into offices and laboratories for examination, study and treatment, including minor surgery. The remodeling was designed by architects Campbell & Aldrich (Walter E. Campbell and Nelson W. Aldrich), with the client shown on the plans as the Smithwick Foundation. Architectural plans for the remodeling — including floor plans and a building section — are included in the City of Boston Blueprints Collection in the Boston Public Library’s Arts Department (reference BIN R-108). 203-205 Commonwealth remained medical offices until 1969. On January 14, 1970, 203-205 Commonwealth were acquired from University Hospital, Inc. (successor to Massachusetts Memorial Hospitals, Inc.) by real estate dealer Nick Haddad, trustee of the Cook Realty Trust. In April of 1970, Nick Haddad was cited by the Building Department for failing to secure a permit to change the occupancy from a doctors’ clinic to offices. He subsequently obtained a permit to convert the property into 22 apartments, and in March of 1973, was cited by the Building Department for failing to secure a permit to change the occupancy from 22 apartments to 21 apartments and real estate office (which had been established in the first floor front). On May 10, 1979, Stephen V. Miller, trustee of the 203-205 Mil-Cav Renewal Trust, purchased 203-205 Commonwealth from Nick Haddad. In August of 1979, he filed for (and subsequently received) permission to convert the property from 24 apartments into ten apartments. And on December 10, 1979, he converted 203-205 Commonwealth into ten condominium units, the 203 Commonwealth Condominium.